N/A Japanese. 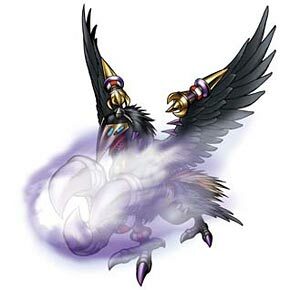 The yatagarasu is a legendary three-legged crow associated with the sun god Amaterasu and with victory. Leppamon + Win Ratio 60%! XV-mon + Win Ratio 60%! "This black Bewitching Bird of trials invites you to El Dorado!" You may modify up to two of your opponent's Option Cards into Red Frames. When your opponent is a Digimon belonging to the Dark Area family, your attack power increases by 450.